Dr. William R. Shumaker is a doctor of Optometry and received his degrees from the Southern College of Optometry (SCO) and the University of Alabama – Birmingham (UAB) School of Optometry, respectively. He is a member of the American Optometric Association (AOA) and the Tennessee Association of Optometric Physicians (TAOP) where Dr. Shumaker served on the board of directors for eight years. 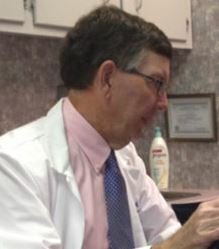 He has also served as an officer of the Northeast TN Optometric Society (NETOS). Dr. Shumaker regularly attends continuing education conferences on the topics of ocular medications, contact lenses, and treatment of eye disease and injury. He is board certified to diagnose and treat eye diseases. Dr. Shumaker, a native of Bristol, graduated with honors from Virginia High School and received his undergraduate education at the University of Tennessee and East Tennessee State University. He has practiced optometry in the same location for over 34 years.